I’ve never been much of a drinker. I enjoy wine and beer, but 3-4 drinks of any kind send me looking for a bed. In college, I was always relieved when 2 a.m. rolled around and the bars closed. If you were tired, you could go home and you didn’t look like a loser. My utilitarian drinking style was put to shame the first time I went out with a New Orleanian in New Orleans, back in 2004. We were out dancing, and I was ready to split at 2 a.m. But the bar didn’t close at 2. Or at 3. I realized we could be out all night. I couldn’t say anything because then I’d be a loser. Les Bon Temps. It is open now. After unloading our car last Monday night, my boyfriend and I decided to toast our new city at Les Bon Temps, a very famous New Orleans bar right across the street from our house. “We should become regulars here!” he declared as we walked over. But I forgot what I was dealing with. This is New Orleans. 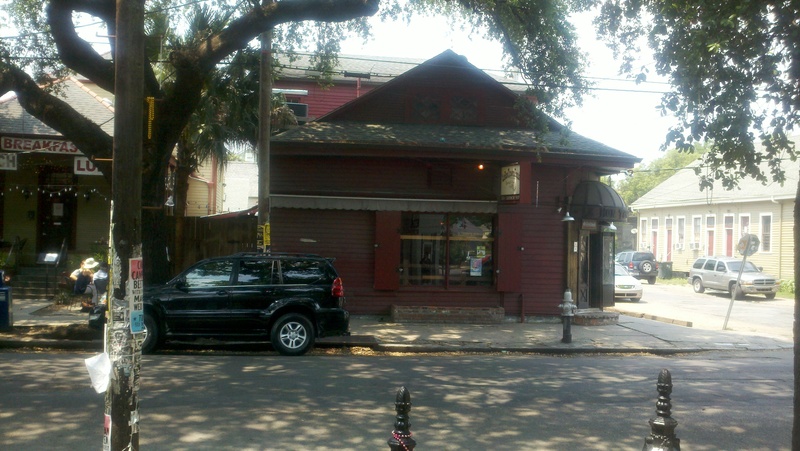 A Les Bon Temps regular introduced himself to us and explained his relationship to the bar. He lives in another part of town, so usually three times a week he drives over to Les Bon Temps and takes a cab home. He’ll drink for a few hours there some nights, leave, and then come back. Bartenders regular reduce his all-night drinking tab to $4. The only downside about Le Bon Temps? “The bar is only open until 4 on the weekdays,” he explained. Only open until 4 a.m.? My boyfriend and I exchanged a look. Two drinks later, suitably giggly and tired, we both wanted to go home. “But what’s he going to say?” I whispered across the table, nodding my head in the direction of the regular, who was now playing pool. “We’ll remind him we drove 8 hours today and moved our stuff into a new place,” my boyfriend said. I felt like a moron. Here I was, worrying that this guy I met 45 minutes earlier was going to judge me for being unwilling to stay out. He was on the phone when we left. Relieved, I waved and skipped away, as if to imply that I was just off to another bar to keep the party going. I just hope he couldn’t see us going into our house across the street. Today my boyfriend and I are going to the 610 Stompers Bar Crawl. My goal is to make it until the end, which is 8 pm. There’s an after party that goes until 10 p.m., which I suspect is not true.